A speedster is committing crimes in Central City and The Flash is the prime suspect! Thankfully, Team Flash is quick to figure out that this new speedster is a woman but they'll have to run themselves ragged to bring her to justice before Iris is forced to write an article blaming The Flash for her crimes by her new editor. Sam Raimi's Spider-Man (the direction of the sequences of Eliza Harmon talking to Trajectory seem to be inspired by the scenes where Norman Osborn spoke to The Green Goblin - another villain who got powers from a strange formula and fell victim to madness) and The Flash comics of Mike Baron, particularly The Flash Vol. 2 #12, which introduced the Velocity 9 drug and had The Flash being questioned after a variety of robberies committed by a super-speedster occurred. We're told that everyone in a ten block radius was robbed within six minutes during Trajectory's first crime spree. Surely there was a video camera somewhere in that radius which could have gotten a shot of Trajectory and proved she wasn't The Flash? By contrast, how DID the newspaper get such a clear shot of The Flash and Trajectory next to each other? Violett Beane hasn't been given much chance to do anything on the show besides play the damsel in distress. This episode corrects that, though unfortunately it does this just before she is Put On A Bus. Still, it's a good send off for the character. On a similar note, Allison Page manages to inject a truly tragic note into her performance as Trajectory. It would have been all too easy to play her as a generic crazy villain but there's enough subtlety at play that the viewer is kept guessing until the end of the episode and you feel genuinely sorry that Barry couldn't talk her down. The sequences with the super-speed fights include some of the series' best special effects to date. In the original comics, Eliza Harmon was a fan of super-speed heroes. She was given super-speed powers after she volunteered for The Everyman Project - an initiative sponsored by Lex Luthor to give superpowers to ordinary humans while allowing Lex to legally build an army of superhumans that were beholden to him. Eliza was one of the first heroes to join Luthor's superhero team - the new Infinity Inc.- and was given the codename Trajectory. Unfortunately, Eliza's powers were unstable and she turned to drugs to be able to slow herself down enough to function. Her volatile personality caused her to argue with Lex Luthor and she fell to her death after he deactivated her powers. The DCTVU version of Eliza Harmon is a friend of Caitlin Snow's and a former co-worker at Mercury Labs. She reverse-engineers the Velocity 9 - nominally as a means of getting ahead on her work- but develops a split personality who revels in causing trouble that calls itself Trajectory. As has been noted before, Velocity 9 in the comics was incredibly addictive and the side-effects of abuse included premature aging, exhaustion, red eyes, staring, salivating, and eventually death. At the end of the episode, Jesse is seen getting on a bus for Opal City. In the DC Comics universe, Opal City is the home of the superhero Starman and known for its Art Deco architecture. As the episode opens, the STAR Labs team is trying to help Barry reach Escape Velocity - the speed needed to defy Earth's gravity. This is roughly 11.2 kilometers per second or 7 miles per second. Or 40,270 km/h (25,020 mph). Caitlin puts a micro-tracker in the most recent batch of Velocity 9, allowing them to track Trajectory. In order to jump the collapsed bridge, Barry has to run at Mach 3.3. This is approximately 2,531 mph or 4,075 km/h. Harry: So, to reach Escape Velocity, you're gonna have to go... (scribbles on a pad and shows it to Barry) ... that fast. Barry: Well, "that fast" is impossible. I can promise you that. Harry: Ah-ah. "Nothing in life is promised except death." Barry: If the game is already rigged, why can't I level the playing field? I mean, if everybody else is cheating, how can - ? (pauses) I want to be fast enough to stop Zoom and any other speedster who tries to hurt my friends. Shouldn't I use everything in my power to do that? Harry: You want to take a short cut? Is that right? You want to take a short cut? Remember this you lose a chunk of your humanity every time you compromise your values. Barry: (chuckles) I'm sorry, but that's real good coming from you. Harry: So don't be like me. Be better. Be like Jay. Trajectory: My name is Trajectory. Cisco: Oh, why do the crazy ones always name themselves? Pretty much every single scene involving Iris's new editor. There's too much to list here but it seems like they're trying to make him out as a charming cynic but the performance coupled with the dialogue make him out to be a sleazy version of J. Jonah Jameson who has no ethical problems with romancing a female subordinate. Harry Wells is apparently a Kanye West fan, quoting one of his songs to Barry. Beyonce Knowles was a Senator on Earth 2. The drink known on Earth 1 as a Kamikaze does not exist on Earth 2. Cisco cannot dance. At all. According to Joe, Trajectory was able to rob everyone in a ten block radius in six minutes. Cisco has two Vibe Visions of the course of the episode - both of them are of Zoom and both of them are in close proximity to Jay's helmet. Barry makes reference to the deaths of Earth 2 Joe West (213) and Jay Garrick (214) in explaining why he is determined to become faster. Caitlin tells Barry and Cisco about Velocity 9 and the deadly side-effects caused by prolonged usage. 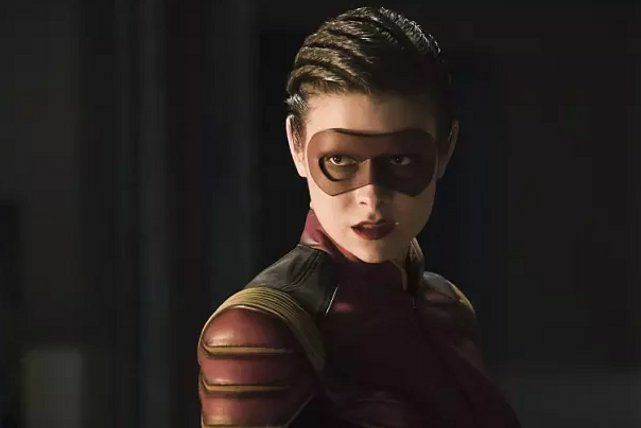 She also tells them about how using speed-enhancing drugs was killing Jay Garrick and causing his cells to degenerate, which she discovered in 214. Iris' editor claims to have won the Dornfield Award for Investigative Journalism for his work in exposing a corrupt mayor. Both Jesse Wells and Harry Wells have PZ Negative Blood. This is apparently a common blood-type on Earth 2. There is no word on if there is an Earth 1 equivalent. After overdosing on Velocity 9, Trajectory's lightning turns blue just before she is vaporized and her body burns into ashes while running. Jesse Wells sneaks out of STAR Labs and heads for Opal City. Barry deduces - based on Trajectory's lightning changing color - that Zoom must also be sick and dying from abusing speed drugs like Velocity 9. He then makes the intuitive leap that Jay Garrick IS Zoom. Cisco handles Jay's helmet and has a vision of Zoom removing his mask... and seeing Jay Garrick's face. Iris doesn't come off all that well at the end of this episode. First for failing to call her new boss on his attempts to flirt with her and then for deciding she's interested in pursing that option - seemingly for no other reason than to fight her apparent predestination to wind up with Barry. Largely forgettable. The main purpose of this episode is to push everyone forward on unraveling the mystery of who Zoom is. Most of the cast doesn't get a chance to do much and there's not nearly as much good dialogue or humor as usual. And the subplot with Iris is just painful to sit through for several reasons. That being said, the cast give the material far more gravity than it deserves and even the worst moments (like Barry's enraged scream at the end) aren't nearly bad enough to outweigh the good.